Want to be happier in life? If you’re wondering how to take this metaphorical leap, consider two synergistically inspiring items from legendary singer and actress Judy Garland. The first is her above quote which makes a case for authenticity. The other is her unforgettable performance singing Somewhere Over the Rainbow in the 1939 movie The Wizard of Oz. Garland’s quote and song convey the same message: a happier and loftier life experience awaits us as we step out and over our proverbial rainbow. We do it by taking a quantum leap and acting upon a belief system that lies within. Can you remember yourself as a youngster? Back then, you effortlessly connected with the enlightened belief in a brilliant and benevolent world. It was easy to trust in the beauties of a sublime life; childhood innocence needs little prompting to be drawn into the finer attributes of goodness. Over time, however, many childhood dreams were forced to fade. They were programmed to submit to wearisome ideas, to surrender to voices appealing to “grown up” reasoning. We’ve ultimately conceded our aspirations, lost much of our natural joy and adapted ourselves to a lesser world. It’s no wonder that societal norms have turned our previously magnanimous hearts into darkened shadows of a defeated, if unwitting, prey. We’ve been beaten down by naysayers who already succumbed to mediocrity and unwittingly convinced us to do the same. We’ve also been daunted and taunted by demigods laying claim to their rarefied spaces in the world. Rather than welcoming innovative ideas or new contributors, they’ve guarded their positions. So human hearts have sunk as faulty power structures remained intact, unquestioned and unchallenged. Serving the status quo contributes to a state of unhappiness. It stifles our soul, quenches our hope and denies us the dawning of a brighter and more abundant life today. We can remain within the these limiting frontiers or launch out to the inner — and outer — experience of pioneering growth. We can answer the call for more when it beckons us to cross over the rainbow. Perhaps you’ve been moved by Judy Garland’s Dorothy character in The Wizard of Oz. Your inner hopes for happiness and self-manifestation cannot be fully extinguished. Like her, you’ve refused to accept the limiting perspective presented by a fearful, dark and lackluster world and you feel destined to experience more. Serving the status quo versus stepping out is a life story to be played out by us all. What we should also discover is that Dorothy’s journey over the rainbow and on her way back home tells everyone’s tale of personal growth and enrichment. Her story provides the universal parable of our belief in the unseen and our faith in the eternal paradise of the heart. At the film’s beginning, Judy Garland’s young Dorothy character is prayerfully singing about traveling “somewhere” over the rainbow. She can’t lay physical claim to it, but her heart knows the veracity of that elusive place. Watching Garland’s character, we learn the “how to’s” of a return home to our greater heart space. We observe Dorothy activate her courage, leverage her wits, develop new relationships and confront the curtains of presumptive authority. In facing the fiery trials of doubts and fears, Dorothy tests her own mettle and presses ever forward in her inner belief. Eventually, the tentative, perplexed and childish Dorothy matures and metamorphoses into a first rate version of her grander self. Watching the purposed character in Oz, we’re not to know exactly how Dorothy leaps across a rainbow to reach the bigger dream burning in her heart. We’re never quite sure of the exact deed she did or the moment when she transcended the last daunting thought poised to tame her emboldened spirit. Yet, inwardly, we understand how Dorothy’s quest to return to a superior and loving society eventually becomes her new experience. It’s the process, rather than the details, that transformed her dreams to reality. And it’s the emboldened spirit that prompted a first rate version of her character to manifest. 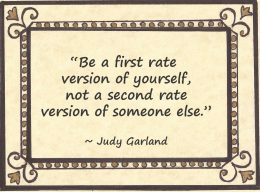 We are all a microcosm of Judy Garland’s quote calling forth our truer self. Inwardly, our hearts still aspire. We yearn for the fuller life our childlike imaginations prepared for us. Our spirits, in truth, don’t want to settle for second-rate versions of ourselves. But a personal leap of faith is required to embody Judy Garland’s Dorothy character. We must step out to “un-do” our acquired trainings and beliefs. We must intentionally pierce through our tangled labyrinth of social, mental and emotional barriers. Best wishes for happiness as you step over the rainbow and claim a first rate version of yourself, too!